Last week I had the great fun of attending a party at the Food Network kitchens, which celebrated the launch of their new blog, Food 2. Already on my go-to blog list, Food 2 caters to a young, professional crowd with a passion for food. Most recipes on the site require only a few minutes to prepare and there's even a post about cubicle cooking. Weird? I call it innovative and whimsical. At the party, we got to see the Food Network test kitchen, which is huge and very state of the art. We even sampled goodies prepared by their friendly staff, which included mutton burgers, veggie arepa minis, grilled cheese sandwiches, blue fish pickled onion sandwiches as well as country smoked ham on buttery biscuits. Some of the nibbles were better than others and I preferred the interesting mutton burger, which was tender and flavorful, albeit a bit undercooked. I also liked the mini arepas with their sweet, savory flavor and a nice crunch around the edges, packed with corn, cilantro, tomatoes and onions. Yum! 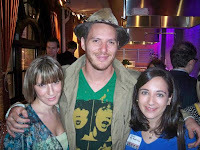 Another highlight of the party was meeting Spike Mendelsohn, Top Chef contestant and star of Food 2's video series Kelsey and Spike Cook. I like this show because it portrays two culinary perspectives, one (Kelsey's) is more traditional yet still modern and the other (Spike's) is unconventional and provocative. I tend to like the latter but you can see for yourself. In their latest episode, they show how to grill steak two ways. Spike was real cool and friendly, revealing that he too lived in Astoria at one point and relished in all of the amazing food choices that our neighborhood offers. He's Greek so naturally, he felt right at home. Enjoy Food 2 and check out Spike's show to get some good food ideas. I thought I saw you at the Food2 event! Glad to hear you had a good time. I'm sorry I didn't step up and finally met you in person! 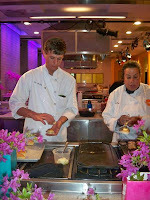 Here's my review of the event: Food2 Launch Party at the Food Network Kitchen.